Double your adventure in Nassau with a fun day of exploration that includes a scenic catamaran cruise and panoramic motor coach sightseeing drive. To kick off this three-hour tour, join a friendly and skilled staff aboard the custom-designed Seahorse Catamaran and cast off from Paradise Island Harbor for a spectacular 45-minute jaunt. As you glide across dazzling turquoise Bahamian waters, you’ll not only delight in complimentary rum punch and soda, but also catch a glimpse of picturesque lighthouses, celebrity homes, and mega yachts. Once back on dry land hop in a comfortable, air-conditioned bus to start your sightseeing trip past the bustling Straw Market, Governor’s Mansion, and Gregory’s Arch. Enjoy a quick stop at the 18th-century Fort Fincastle atop Society Hill, where you’ll also discover the Queen’s Staircase, or “66 Steps,” which is carved out of solid limestone rock. A journey across the bridge lands you at the sprawling Atlantis Paradise Island, a world-famous beach resort featuring a beautiful lobby and plenty of boutiques for your souvenir shopping pleasure. Head back with your guide to port, or opt to stay a bit longer and arrange your own transportation back to the ship — the choice is yours. • Scenic Cruise: Delight in stunning island views and complimentary rum punch while gliding in a catamaran across crystal-clear Bahamian waters. • Historic Sightseeing: Enjoy an air-conditioned motor coach ride to the 18th-century Fort Fincastle, Queen’s Staircase, and other notable landmarks. • Atlantis Paradise Island: Shop for authentic souvenirs at this world-famous resort before conveniently being escorted back to port. 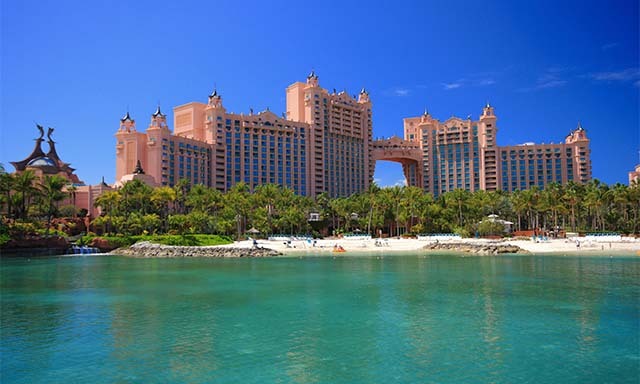 • Guests may top to stay longer at Atlantis, provided they arrange their own transportation back to port. • This tour is not solid wheelchair/ ECV accessible. • Folding wheelchairs are acceptable at guest’s discretion. • Guests must be able to walk a few steps to the embarkation point and navigate stairs onboard the catamaran and bus. • Twenty four hours advance notice required for cancellation or no refunds.